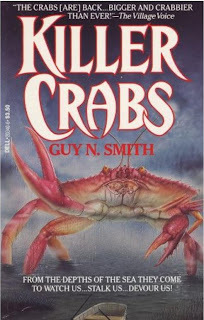 For your crustacean delectation, I present these paperback editions of Guy N. Smith's infamously crass yet undeniably charming Crabs series. Which is about giant man-eating crabs. Which of course you knew. 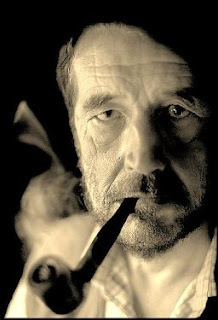 Originally published in England by New English Library and Grafton, during the late 1980s the series was repackaged for American consumption by Dell. 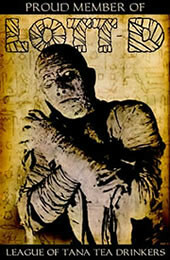 To which I'm sure pulp-horror fans shouted a heartfelt Huzzah! 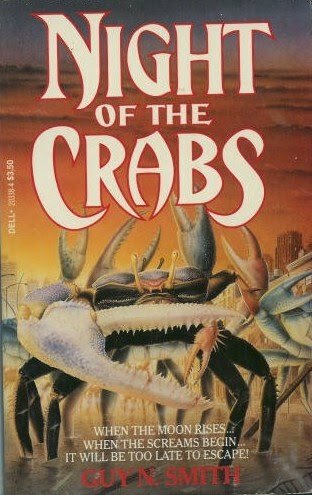 At the top, you'll see Night of the Crabs (UK 1976/Dell 1989) The original (but not the first published in the States; that was Killer Crabs). But this cover doesn't give you a sense of scale so there's no way to know that they're GIANT CRABS. Boo. But check this out! 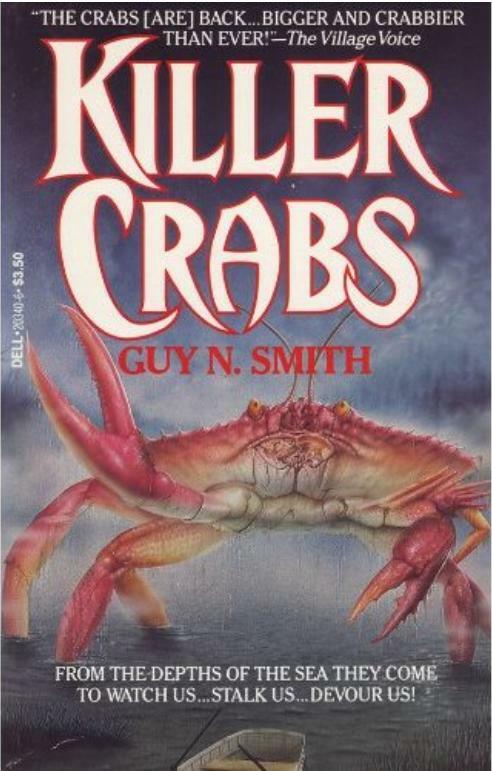 Killer Crabs (UK 1978/Dell 1989) Okay, here you can see this is a GIANT CRAB. 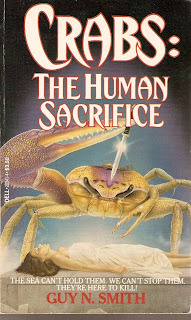 Also, I'm assuming, a KILLER CRAB. Read it early this year. The Origin of the Crabs (UK 1979/ Dell 1988) The crabs have crossed the pond! 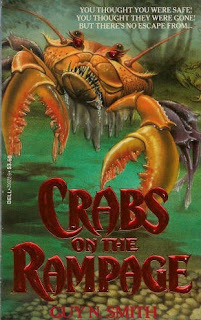 Crabs on the Rampage (UK 1981/Dell 1988) Is that crab drooling? 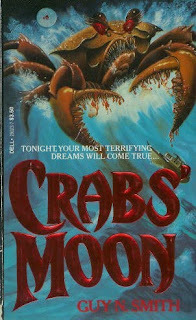 Crabs' Moon (UK 1984/Dell 1988) Now that's an ENORMOUS CRAB! But what makes me happiest about this cover is the correct use of the plural possessive apostrophe, which is quickly becoming obsolete because people are illiterate. What is it with that Guy, and crabs? Dr. Freud call your office! I'll have a crabby patty! Lovely. This post made my morning. Holy smoke! In Crabs' Moon that crab is big enough to fight Godzilla! 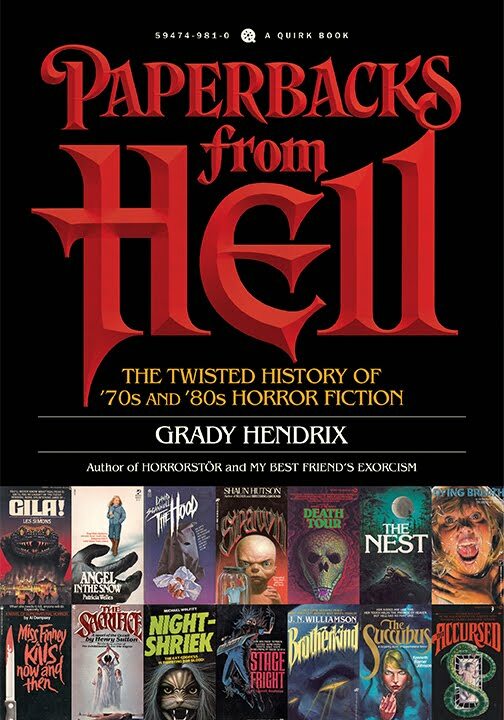 I have a feeling a few of these will be on my shelf before the year is finished. I just can't resist them, not when I'm so curious to see what they are like. You should have lots and lots more awards.. I need to get my hands on these books! Its a giant enemy crab! Hit its weak spot for massive damage! Thank you Jen! Let me know if you're able to get your pincers - er, hands on any of these, esp if CHEAP. Great to see the Crabtastic Mr. Smith getting a guernsey on your blog. I collected these US editions a while ago (as I'm a Smith completist) and thought them amusing; I was never sure about the knife, either; hardly a substitute for giant pincers!). The proportions are kind of wonky on most covers, too. The NEL Crabs' Moon' gets the punctuation right also. 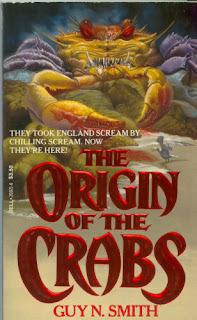 William, for pure pulpy goodness, the Crabs books are sublime. Smith is his own industry! Why do you have a knife? YOU ARE A CRAB. Snip her head off with your enormous claw and be done with it! 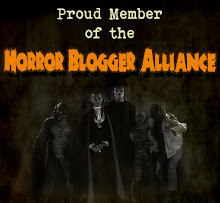 Will, I LOVE your blog!